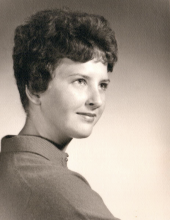 Geraldine Young passed away peacefully on April 1, 2019 in Winter Garden, Florida with her family at her side. She was born on November 21, 1942 the daughter of Harve Adams and Bessie Little Adams. Geraldine is survived by two sons, Travis Young of California and Jamie (Amelia) Young of Florida and by a sister, Phyllis Wilson of Annville, KY. She was blessed with one granddaughter, Allie Young. Geraldine was preceded in death by parents, Harve & Bessie Adams and by her husband, John H. Young. Geraldine was a member of the Moores Creek Holiness Church. "Email Address" would like to share the life celebration of Geraldine Young. Click on the "link" to go to share a favorite memory or leave a condolence message for the family.